Dark Franchises is a study in personal evil. Read it alone, but you will need someone securely grounded in faith you can trust to talk to about it. You may find it quietly disturbing. If we can make one person aware and steer them clear of patronizing a single “Dark Franchise” our work has not been in vain. It's unusual for a poetry collection to be a “page turner”, akin to a good mystery, but poet Naimon Lyons achieves that urgency and desire to read the next poem, and the next, and the next, in his recent chapbook Dark Franchises. Lyons' thought-provoking dichotomy of images cuts to the very essence of ethical and moral issues. These poems grab you in the center of your gut, demanding that you see truth. But just when we think we are traveling deeper and deeper into darkness, perhaps too deep, Lyons jerks us back, as in the last stanza of “Despair Desperation and Hopelessness”, by rejecting that darkness. His balance of tension and sardonic humor addresses timeless topics, yet cuts to the quick of our contemporary cultural and social dilemmas. An outstanding read. 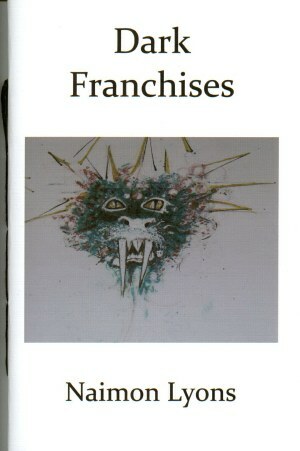 Dark Franchises is a collection of 24 poems calls the reader to reflect on the temptations that are for sale in today's world. Through his collection of 24 free verse poems with titles like Lies I, Vanity, Doubt, and Lust he encourages the readers' contemplation of what is so easily bought by people. His poetry creates an awareness of the struggle to avoid falling into these traps, by posing questions, offering examples of what fills modern life. Only through awareness of what the world offers can man resist the dark franchises. Naimon Lyons warns us through his work of the difficulty in existing as a whole man. In Dark Franchises, Naimon Lyons shares with the reader the darkness that filled the earth after the fall of mankind in the garden when all eyes were first opened to evil. Through his 24 free verse poems the reader sees the evil that is so abundantly destroying man's peace. Greed, Hate, Lust, Ignorance, Vanity, Poverty and Hopelessness all are part of the Dark Franchises where business is ready and waiting and always open for business. Although Naimon Lyons writes that man's true nature seems to always be crashing through, he holds out the hope feely given by the faithful Father. I've read and re-read Dark Franchises to let it sink in. My first time through was not as meaningful as later readings. Maybe that's because I'm not familiar with various poetic forms. I tend to see only what's on the surface and it takes me a while to dig deeper. But as I read each of them again, aloud, I got past the obvious theme that tied them all together and began to recognize myself as one of the "best customers" of many of the Dark Franchises. As a Christian, I can point to Christ in answer to each of these Franchises, yet the work is a stark reminder that even in Christ we struggle daily to resist their tempting pull. To me it's not a work to be enjoyed but one to be pondered and followed with prayer. This new collection of poems by Naimon Lyons will cause you to smile, nod your head in agreement, and most of all evaluate where you stand on many issues of life. Each poem challenges you to look at what you believe and how you got there. We take so much for granted, and usually just swallow what others say, but in reading these poems, you are alone with your thoughts and you may have to be responsible for them. That is a good thing (a la Martha Stewart) because we as a culture have become lazy, too tolerant to dare speak up, and sadly unaware about who (and whose) we are. I loved the writing, the flow, as well as the little shock of current that makes you face the truth. Naimon Lyons is a Christian who loves the Lord, his family, and his invaluable friends. He is an undiscovered recorded songwriter, and this is his second published collection of poetry with Foothills Publishing. Naimon is from Thompson, Ohio and has a Bachelor of Arts degree in Political Science from the University of Cincinnati. is a 36 page hand-stitched chapbook.